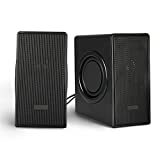 These speakers deliver rich sound with enhanced bass. 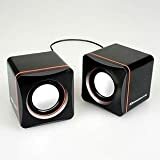 Perfect for listening to all your music, playing games and watching movies. Plug-and-Play design powers via USB port with no external adapters required. Rear-loaded volume control allows for quick audio adjustment. 3.5mm audio connection plays music from computer or other audio devices like MP3 players, tablets or smartphones. Compact design makes relocation easy and hassle-free. Powered through USB. Audio through 3.5mm jack input. Windows 10 Home is here. While other towers have been standing still, HP has revolutionized the category. From magnified performance and reliability, to its stylish redesign, this HP Pavilion is the best thing to happen to towers in over 20 years. This desktop comes infused with style. Revolutionize your workspace with the redesigned HP Pavilion.Decades of experience have taught us there’s nothing more important than trust. Our rigorous set of hardware tests help ensure you always get proven reliability.Up to 1 TB of storage. With unlimited access to music and exclusive content for HP customers, there’s no need to search for it, as it comes to you. Windows 10 Home is here. Do great things confidently with the familiar feel of Windows – only better. Connect to displays, printers, devices, and more with ease. HP with B&O Play delivers the rich, authentic audio experience that immerses you so deeply in your music and entertainment that you can feel it. Don’t just listen… let HP with B&O Play move you. Add a second display for a more immersive computing experience. With dual monitors, you can increase your productivity, boost your gaming experience, or just make multitasking easier. Watch DVD movies using the optional, integrated optical drive-or write your own media.